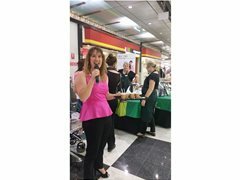 The Spruiking Specialist has a team of spruikers promoting retailers in shopping centres around the Brisbane area . We also spruik at other venues during speciality promotions . We mainly promote Sale events and discounts on retailers products . Our job is to entice passers-by into our clients store . We must be excited , enthusiastic , energetic , articulate and have a bubbly personality . days are mainly Thurs , Fri , Saturdays . Shifts are 3 to 4 hrs , normally 10 to 2pm or 11 to 2pm . Work is spasmodic depending on how retail is performing . As a spruiker you are required to enthusiastically promote a retailers product or service , on the microphone , standing in front of their store . You smile a lot , have lots of energy and a bubbly personality and the excitement in your voice attracts customers into our clients store . It's a great asset if you are an excellent ad-libber , as we don't get a script . Spruiking is a fun gig with flexible hours .